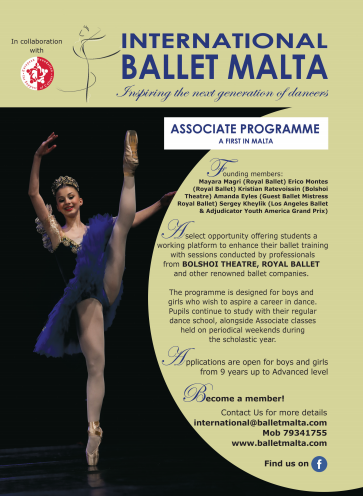 The Brigitte Gauci Borda School of Dance together with the European Foundation for Support of Culture is organising International Ballet Malta 2019, the programme of which will include master-classes and ballet performances. The main goal of the project is to attract the world dance community to Malta and create a unique platform for cultural exchange between young talented dancers. Ballet lessons will be conducted by leading world choreographers from the Royal Ballet (Great Britain), the Bolshoi Theatre of Russia, Ballet National de Marseille (France), Royal Swedish Ballet (Sweden), and other renowned ballet schools, colleges and theatres. The apex of the summer educational programme will be the show of one of the most famous and popular classical ballets, in which both world-class stars and young talented dancers will take part. The ballet production will be shown in December at the Royal Opera House in Valletta.